Home / The Buzz / Super Staffies – Britain’s Top Dog! As you know, we Guru Geeks love dogs in all shapes and sizes. We were over the moon to find that the Staffordshire Bull Terrier took top spot in ITV’s Britain’s Favourite Dogs show. They’re such lovely, happy dogs and make perfect pets. SBTs really, really love hanging out with humans. They’re good around kids (although the recommendation tends to be older children) and will greet your friends enthusiastically. They love to play, so anyone who brings a ball or chewy toy will be a hit! The flip side of this is that they can suffer from separation anxiety, making goodbyes heart-rending for both of you. If you work long hours, a Staffie isn’t the pet for you, unless professional pet sitters or doggy day care are options. If you want a dog to play with, the Staffie is perfect. They’re full of energy, and love to play interactive games with their people; and their enthusiasm for life is truly infectious. Cancel your gym membership, and have a daily workout in the park with your SBT instead! These intelligent dogs take well to training, and we’ve heard that SBT puppies are easy to house train (yay!). They’re quick to learn new tricks, which makes the teaching process great fun. The recommendation is to train them early and thoroughly, to harness that intelligence and prevent it from becoming stubbornness. Hooray for short coats! They need a good weekly groom, and that’s about it. It’s good to keep baths to a minimum otherwise their skin and coats lose their natural, protective oils. Our cold pressed dog foods will also help to keep their coats in glossy, tip-top condition. The infrequent bath regime suits most Staffies, as they don’t really like water. 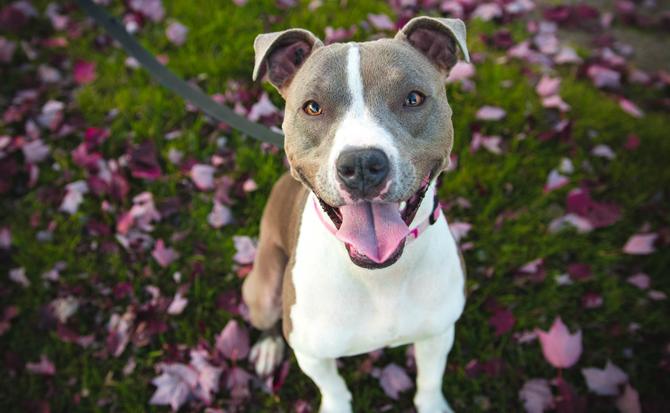 OK, OK, we know that personality is more important than appearance; however, Staffies are fine-looking dogs with the typical intelligent face of a terrier, including that much-loved grin. Their distinctive short faces are topped with pricked-up ears that are best described as “expressive” (spend time with a Staffie and you’ll see what we mean!). They have a medium-sized, stocky body and their coats come in all sorts of colours. Oh, they certainly do… Their high-energy approach to life doesn’t half make them hungry and a protein-rich diet suits them well. Try them with our Full On Feast cold-pressed dog food – sure to satisfy even the busiest and most boisterous Staffie! Does a Staffordshire Bull Terrier sound like the perfect pet for you? We love their happy and sociable natures, and think that their place at the top of the dog charts is well-deserved!